Kanye West Fashion Line: ‘It will be extraordinarily expensive’ | Pop Buzz! 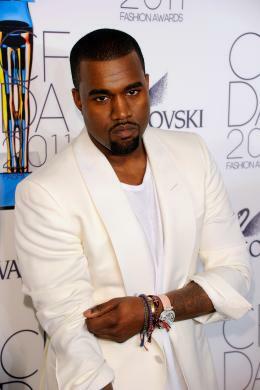 In late June it was announced that Kanye West was working on a womenswear fashion line for the 2012 spring/summer season. And although some mocked it as just another celebrity rumor. Pop Buzz! knew better. According to a West insider who is working alongside the star on his debut line, a number of high profiled fashion industry heavyweights are involved in the process . And the fact that it will be unveiled in Paris, the grande dame of Fashion Weeks, adds further credibility. In an interview with Grazia Daily, the source described how hands-on Kanye had been. But this was sometimes more hindrance than help. They added that they would be 'amazed' if the collection was ready in time for its Paris show date, and doubted many pieces would even make it to the shop floor. In terms of style, they admitted that given Kanye's working methods, it was still all subject to change, but was 'seemingly based on Samurai'. At the time of publication there was a lot of ivory and gold, they said. Sportswear, it seems, is at the centre of the collection, as baseball jacket and biker shapes, hoods and sports-luxe were listed as themes. The insider also revealed that Harper's Bazaar Australia's fashion editor, Christine Centenera, has been present with Kanye for many of his visits, leading them to believe that she may be his muse. No word yet on which Chicago retailer or major department store will carry this exclusive new line.